The LAUGFS Gas PLC team at the 2016 CA Annual Report Awards Ceremony. 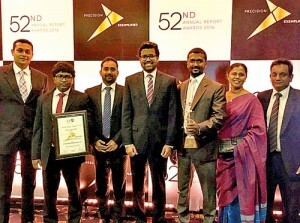 LAUGFS Gas PLC secures another prestigious Gold Award at the 52nd CA Annual Report Awards held by the Institute of Chartered Accountants of Sri Lanka, the fourth consecutive year LAUGFS Gas has won Gold in the power and energy sector. “We are honoured to have received the Gold award yet again at the CA Annual Report Awards this year, which reinforces our commitment to reporting excellence with transparency and integrity,” noted LAUGFS’s Group Managing Director, Thilak De Silva. This is the third integrated report by LAUGFS Gas PLC, adopting globally recognized standards and practices including the Global Reporting Initiative (GRI) G4 guidelines, to present its economic, social and environmental performance, a company media release said. LAUGFS Gas PLC is a diversified conglomerate, listed in the Colombo Stock Exchange. With a strong presence in the power and energy, logistics, services, leisure and real estate sectors, the company has expanded its presence overseas during the financial year, setting up operations in Bangladesh and Dubai.